PDT (Please Don't Tell) -- St. Marks Place. So I had the chance to take a look at a new cocktail place opening up next week at 113 St. Marks Place, the space adjoining Crif Dogs. The place is going to be serving well crafted cocktails, rotating beers on 4 taps and a good selection of beers and wines. They will also be serving food from Crif Dogs next door that will be passed through a small service window at the bar. The food menu is still being developed, but in addition to the menu currently at Crif, there will be some additional items like lobster rolls. 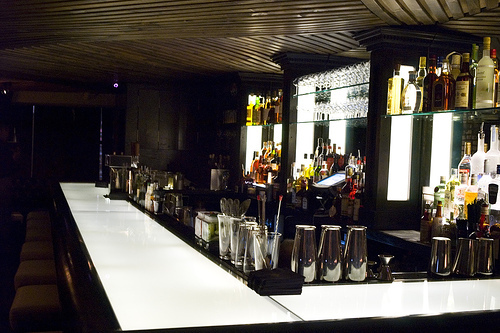 The cocktail list is being developed by Jim Meehan of Gramercy Tavern and Pegu, and the place is owned by Brian Shebairo, owner of Crif Dogs. I haven't seen the actual cocktail list yet, but should have some more details on it shortly. 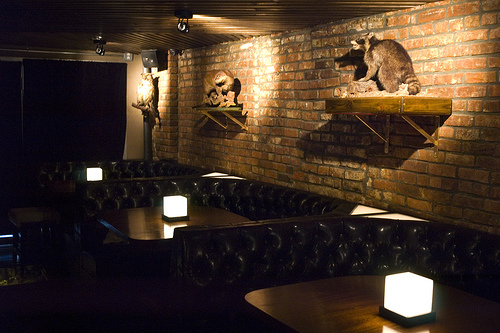 It is a really amazing space, about 13 seats at the bar and maybe another 35 seats at booths and tables. I hope to stop by early next week and grab some photos as well as some intel on the actual drink menus. The only issue they haven't worked out yet is how to handle the door. In order to enter the space, you need to do so through Crif Dogs. There is an old telephone booth that you will enter, and the back of the booth opens to allow you to enter PDT. The logistics on moving people in and out could be challenging. Mon - Thurs 6pm - 2am. Fri - Sat. 6pm - 4am. There is an old telephone booth that you will enter, and the back of the booth opens to allow you to enter PDT. The logistics on moving people in and out could be challenging. That is pretty freakin cool. What is a Crif Dogs? So, I recently attended the preopening of PDT. 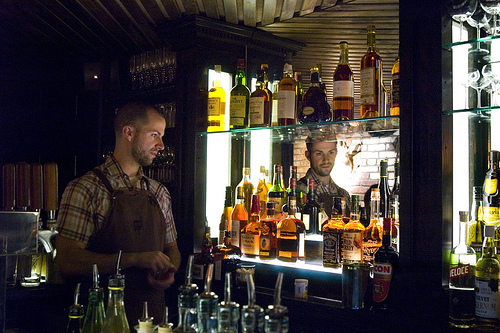 All signs point to this being another fine addition to the NYC cocktail scene. As johnder points out, entrance is through an old-fashioned telephone booth with darkly smoked glass, located to the left of the entrance inside Crif Dogs. This worked just fine during my visit. Interestingly, the customers eating inside Crif Dogs seemed entirely unaware that there was a bar on the other side of the telephone booth. There were no curious dog-eaters poking their noses into the booth to see what was going on back there. I suppose that the amount of time one normally devotes to hoovering down a couple of hot dogs doesn't lend itself to noticing that every so often someone goes into the phone booth and doesn't come out. Anyway... donbert's pictures give a nice idea of what the space looks like. It's modern without being over the top. Small but comfortable. Noise levels, even at full capacity, are reasonably quiet. It imparts the exclusive and "secret" feeling of a place like Milk & Honey, but has a rather more polished and well maintained atmosphere in contrast to M&H's (equally charming in its own way) "frayed around the edges" aesthetic. The bathrooms are cool, entirely "tiled" with bits of broken mirror. The glassware is very nice, and a bit more delicate than higher volume places can afford to use. For most "up" drinks they are using a coupe/balloon-style glass from Spiegelau. These look tiny and delicate, yet surprizingly accomodate 5 ounces. For larger pours, such as their Martinis, Manhattans, Rob Roys, etc. they use a larger "rounded V" glass by Alessi. Ice is the becoming-standard large Kold Draft cubes, supplemented with what looks like pre-cracked Kold Draft cubes, but I understand actually comes from a different machine. They also have some of the most snow-like crushed ice in the City. johnder, who along with donbert will be shaking there from time to time (FYI for those who care: he made the post above before finding out about an opportunity to bartend there), made me just about the best Julep I've had in a NYC bar, using Four Roses 100 proof single barrel, demerara syrup and a large bouquet of mint leaves. John is a proponent of the Julep school that uses mint exclusively as an enticement for the olfactory proboscis, and does not include any with the spirit. The Julep was seved in a metal Julep cup, which again is the kind of touch that's made possible by the small size and lower volume of a place like PDT. In addition to the Julep, I sampled several items from on and off their menu, including an Aperol Sprizz, Trident, Martinez, Up To Date, Pimms Rangoon and Hemingway Daiquiri. All were excellent, although there is some minor tweaking to do (after a not-as-cold-as-it-could-be Trident, we experimented with different usages of ice to get a colder drink), which will surely be worked out before long -- hey, that's why they call it friends & family. John and Don acquitted themselves marvelously behind the bar. Of course, this preview was just a taste of what it to come. I would like see a lot more new cocktails on the list. But, given Jim Meehan's inventiveness and talents, as well as the efforts of whatever mixologists he may be mentoring at PDT, will provide that soon enough. Oh yea... there is also a small service door connecting the back bar at PDT to the kitchen at Crif Dogs. So you can order ridiculously sinful food to soak up all that booze, such as the "Chihuahua" (bacon wrapped hot dog with avocados and sour cream), the "Good Morning" (bacon wrapped hot dog with melted cheese and a fried egg), waffle-cut fries and hamburgers with a range of toppings -- all priced to sell. No simple syrup in the Pisco Sour? What Pisco in use? Is the Royal Bermuda Yachtclub Cocktail ("Lime Juice, Cointreau, and Falernum") missing an ingredient? What's the gin and rye selection? I don't know what the drink prices are. Not sure if they even had them printed on the menu, as it was F&F. But I assume they're in line with what other places like Pegu, D&C and Flatiron are charging (which is to say, $12 rather than M&H's 15). I assume there is simple in the Pisco Sour, they just don't have it listed on the menu. I find this a fairly common practice unless it's something "special sounding" like demerara syrup. People just don't "get" simple syrup. Yea, they probably left "rum" off the ingredient list for the RBYC Cocktail. Because it's a much smaller place than, e.g., Pegu or Flatiron, the selection of spirits is necessarily a good bit narrower in scope. Don and John can likely say what brands are in use, but I can't imagine it's more than 4 or 5 of any one spirit. No scotch cocktails of which I am aware on the menu, but the F&F menu was deliberately made small. I assume they will ramp-up the cocktail selection over time, and this may include scotch cocktails (although I'm not sure scotch is necessarily a favorite base spirit for Jim like it is for Phil at D&C). Let's see if I can answer any of open questions. The prices on the cocktails are 11 bucks. Beer is 5. We have a pretty small selection of liquor right now, but have space for a lot more. In terms of brown liquors now, we have the usual suspects, rittenhouse, weller, four roses, and a slew of scotches. I would try to recall some more, but at this point I have been worn pretty thin in terms of lack of sleep. The lack of rum was a typo. As Sam noted there are some ingredients that are left off the list of drinks, mainly bitters and syrups here and there. The list will get bigger, but until the bar is broken in we will be sticking with the list as is. Given it is a brand new bar setup, there are a few bumps, but hopefully it will all be worked out shortly. Given I have a pretty demanding day job, I don't see myself making a switch to a full time bartender, but for the foreseeable future, I will be probably having one steady night there. Although for the next few weeks, probably more than one. As far as Gins, I can answer that as it is currently limited to, Plymouth, Aviation, Tang, Beefeater, Hendricks. Junipero will be coming shortly as well as Millers hopefully. In terms of brown liquors now, we have the usual suspects, rittenhouse, weller, four roses, and a slew of scotches. I would try to recall some more, but at this point I have been worn pretty thin in terms of lack of sleep. I think I also saw Maker's, Woodford, Jack, Wild Turkey, Sazerac rye, Jamison, Powers, Bushmills, Laird's bonded. . . Hmmm. Everything else is lost in the haze of a booze and hot dog-induced coma. stopped in last night. already packed...they were steadily turning people away....I'm guessing the Eater post had a major effect. had a flaming Chartreuse fizz that was excellent as well as a nicely done Trident and an East India. I wonder if this might have something to do with commercial rents? The other thing I've noticed is that most of these places are a serious hike away from the nearest convenient subway station, and a lot of the properties are (or were) somewhat dilapidated. Of course, rents could be sky-high there. I'm not exactly in that loop. As for the crowding: Isn't the idea that it's going to be a reservation-line place, like M&H? correct on the last one and I think you're correct on the first one as well. The L, 6, and F/V lines aren't really all that far away, and the neighborhood gets a fair amount of foot traffic, too. I've seen several new places open up near me recently, and they're mostly bars. News flash: starting this Sunday (July 15) PDT is open on Sundays! The setting is certainly a good one for keeping out the riff-raff. I was down having a great bowl of ramen at Setagaya the other night with JosephB and we were looking for a place that Sam Kinsey would hang out at as we knew he was in the area, but we were unable to locate any such establishment! Unfortunately, neither of us had read this topic prior to that evening. I guess cell phones don't work in there either? Too bad, as both of us could have used a nice cool drink (or two) on that sultry evening and even more so as we likely would have found a few more familiar personalities as well. BTW, Congrats to Jim Meehan for being named a Starchefs Rising Star Mixologist! The award banquet will be on Tuesday Sept 18th at Mansion. i had one cocktail with some friends tho - and there was way too much bitters in this thing - like probably 10 shakes. i couldn't even taste the fruit or the alcohol. just because they are ambitious and claim to do all the trendy things (ice cubes, fresh juice, gins, classic cocktails, bitters)...doesn't mean the execution is flawless.. i guess they are imitators? Just out of curiosity which cocktail did you have? There are no cocktails currently on the menu that have more than 2 dashes of any bitters, with the exception of the pisco sour which has numerous drops of angostura on the foam for the nose. I got the lowdown on PDT from a friend in the trade when I was in NYC for the bar show early last month. You could have knocked my two friends and I over with a feather when the wall opened up behind the phone booth. I mean, how cool is that? Very early Bat Cave and definitely adding to the overall effect of being somewhere slightly naughty and off the beaten path. Had the pleasure of seeing Donbert briefly and really enjoyed all of the cocktails we had amongst us. Sorry to have missed Jim Himself, but hopefully he got my message that I thought the place was the Cat's Meow. If it weren't such a commute I'd be all over applying for a bartending position at PDT. Definitely my kind of place. I was in last night...can't believe I hadn't had the Up-To-Date before...great drink. I'm not sure what reason for the nomenclature of the Astoria Bianco is....it just appears to be a real martini to me. also sampled an interesting off the menu Peat Monster based cocktail....the Penicillin....its a little sweet but the idea is interesting. (when Cervantes is working I heartily recommend the off-the-menu Chartreuse Fizz...I suppose the other chaps might know it as well). as for the phone booth and wall opening....there's a bar in Milwaukee known as the Safe House (has a James Bond theme) that has done a more elaborate version of that for the past 30 or so years. I think I remember you from the picture in your blog. Weren't you in Monday evening sitting at the bar? I believe you introduced yourself as a Mixologist and a friend of "Crif's" then seeing our cordial bottles asked for all 12 syrups, 6 bitters, orange flower water and olive brine mixed in a glass with 2 oz of liquor of my choice. Phil, with all due respect, I think the record shows that you're not exactly a cocktail expert and sometimes make grand statements for effect. I point this out not as a gratuitous slam, but to contextualize your remarks for others who may be reading along. Most likely the drink you had was a Pisco Sour, which is currently on the PDT menu. This is comprised of pisco (a kind of Peruvian or Chilean white brandy), lemon juice (or lime juice, or a combination), sugar and egg white. It is traditional to add an "aromatic garnish" on top of the egg white foam after the drink is strained into the glass. This occasionally means finely grating cinnamon or nutmeg on top, but more commonly means tipping in several drops (not dashes) of Angostura bitters. These drops are often swirled with a cocktail pick for decorative purposes, like this. 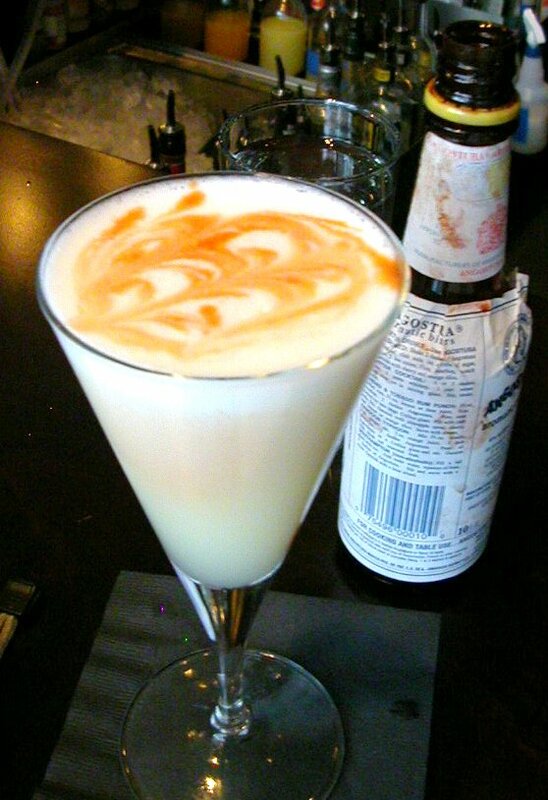 I've had a Pisco Sour at PDT, and it is garnished with 4-5 drops of Anostura bitters in the foam. This can look like a lot of bitters, but in actuality amounts to less than two full dashes. You assuredly did not have a drink with ten dashes of bitters at PDT, as such a drink would be almost undrinkably bitter. Most pisco appropriate for use in cocktails is quite mild in flavor. In addition, PDT uses lemon juice in their Pisco Sour. Lemon juice can often be observed to quietly make its contribution to a cocktail and blend into the background rather than broadcasting its presence up front as is often the case with lime juice. If you were unable to distinguish separate, distinct and unblended flavors of spirit and fruit in PDT's Pisco Sour, and if the aromatic garnish of Angostura bitters found its way into your sensorium as you drank, adding to the overall impression of the libation... these things are a sign that the cocktail was properly, perhaps flawlessly executed -- not, as you suggest, that the staff at PDT are "ambitious imitators." As I think I suggested back in the Pegu Club thread around a year ago, just like with sushi, wine, haute cuisine, literature, opera, ballet, fashion, etc... cocktails prepared in the classic tradition can be immediately enjoyable, but one would like to have accumulated a certain amount of knowledge before suggesting that the emperor's outfit might be a little revealing. I'm not sure what reason for the nomenclature of the Astoria Bianco is....it just appears to be a real martini to me. Well, the "Fitty-Fitty" at Pegu Club is a Martini as well. The "Astoria" part might be to evoke the Waldorf=Astoria Hotel (as in a "Hoffman House Martini"), and the "Bianco" part refers to the use of Martini & Rossi Bianco vermouth instead of the standard French/dry/white vermouth. M&R Bianco is a sweet white vermouth, with vanilla notes. yeah...I noticed that with the Fitty-Fitty too (though I don't like my martini quite that wet...more like a 3-1). I wasn't aware that M&R is a sweet vermouth. that clarifies things.